The task is to find correct picture to replace question mark. that a small "snake" or 2 triangles goes down from top to bottom, from left to right. Then the answer is A. But of course in this case the 5th picture must still have a triangle in the middle. That is one reason to dislike this answer; another would be that it doesn't explain why only 2 triangles move and the 3rd stays still. I can't solve it. Maybe you can? What from the following replaces question mark in the given sequence? There are 3 black triangles on a field with 9 cells. To move a black triangle to an adjacent cells takes one step. From A to 5 takes at least four steps (triangles overlap now). So A is the answer. There's a white field with a black triangle at the bottom. And there is a three-piece snake, consisting of a white triangle followed by two black triangles walking down this field. I believe this is the correct answer. 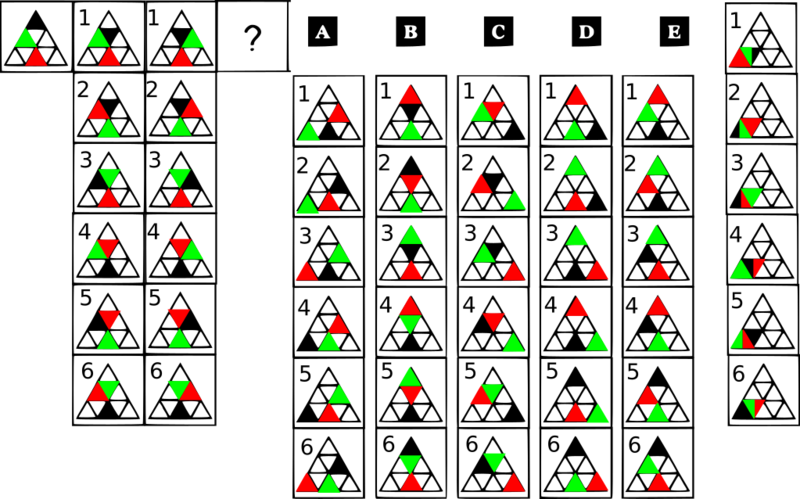 One white triangle is moved each turn AND one is added, either in the 4th or 5th step. 1.You can move one white triangle per turn. 2. you can (optionally) add one white triangle per turn. Then A is the only possible answer that can lead to diagram 5 following the observed "rules". The problem with B is that you inferred that they move to neighbors. The 5th spot and available answers suggest you need to re-evaluate your assumptions. Given the available information, A is the best available answer because there isn't a logical progression from B to diagram 5. Insinuating a pattern, where one does not exist is classic. Was it a functional IQ test? Military? Given an increment in the current mini-triangle with every big triangle then I an proposing that the previous triangle must be able to cover the current mini-triangle (which is white) in a black mini-triangle. Therefore A is perfect as it for fills both of my rules. The first triangle already has a black triangle on the first mini-triangle. 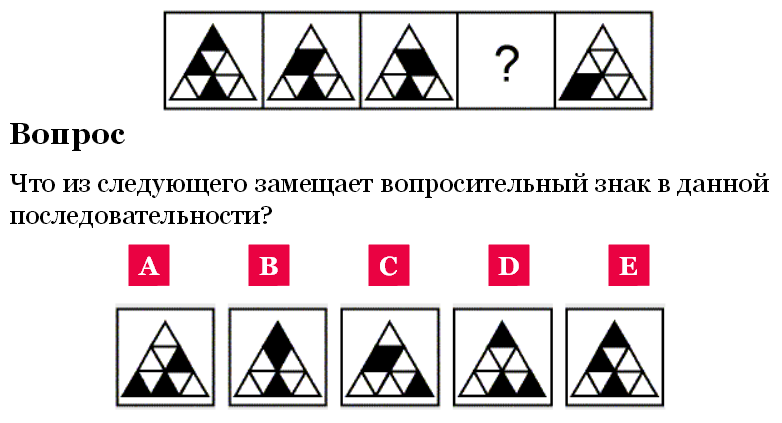 Considering the sequence and the possible answers it seems clear that there are three black triangles, two of which are overlapping in the last situation. From the first to the last situation is four steps. None of the rules of movement that I could come up with would explain the intermediate and final situation if applied four times. So maybe it is not movement but change. 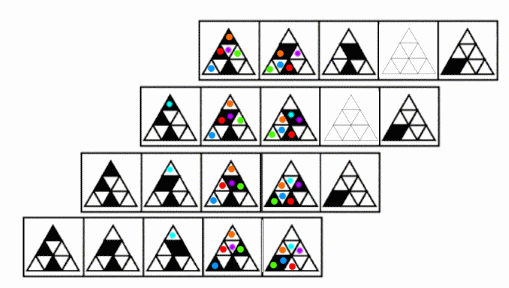 I got pretty excited about this rule: "change the first (left to right, top to bottom) black triangle to white, the next first white triangle to black" (giving answer A), but it cannot explain overlapping triangles, and thus cannot explain the final situation. I've spent a lot of time on this, I still do not have a full answer but do see a pattern that fits the so far preferred answer - A. I haven't been able to detect a pattern with the other answers. Because there are an odd number of triangles there must be something different about the rule for at least one triangle. I can provide a speculative explanation with my cyan dot but am not entirely happy with it. Maybe someone can build on this to provide the final logic? What is the answer to this test question?